Lighting is one of the cheapest and easiest ways to add ambiance and atmosphere to your outdoor living space. It can completely change the feel of your garden or patio. Solar lights, unlike traditional lighting, are a great option because the only cost is investing in the light itself, afterward, they run on that sweet (and completely renewable) solar energy, so it won’t cost you anything to keep them lit year round. The solar industry is booming and that means there are more and better options to choose from for all your solar light needs than ever before. So here’s our list of the best solar lights for creating atmospheric outdoor spaces! By the way, don’t forget to check out our Outdoor String Lights article for more ideas! 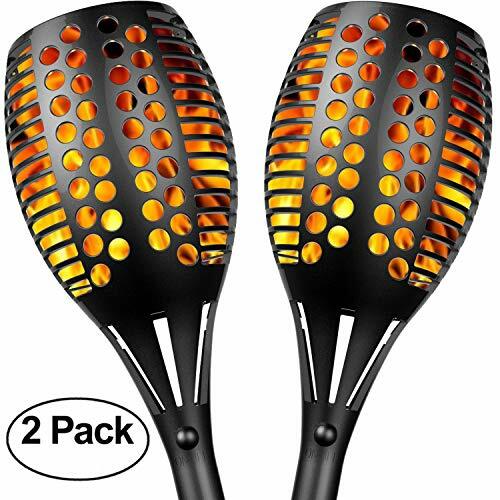 If you want to add the mysterious, flickering vibes of torchlight without the danger of actual flames, the Sunlitec Waterproof Flickering Flame Torches are for you. The light from these solar torches looks like real flames from a distance and casts a pleasant and soothing glow. The light pattern has enough variety that it doesn’t look obviously fake, which can be hard to find in faux-fire lights. This torch uses LED lights with a unique optical controlled technology to create its chilled-out flame look. They’re completely eco-friendly, gathering energy with its solar panel during the day. It takes about eight hours to get a full charge, but you don’t have to do anything except set it up in the light! With a built-in lithium-ion battery, it can run for up to ten hours in the summer and five hours in the winter on a full charge. It’s made to be durable and is IP65 waterproof so that it can stay outside even in the heaviest downpours without taking any damage. The stake is easy to install, either in the ground, hanging it up, or attaching it to a fence or other surface. Plus, these torches are cheaper and just as effective as some of the more expensive options – not to mention, once it’s set up, it will run on its own without costing you a cent. Yay solar power! The Sunlitec Flickering Torches come in packs of two and if you’re curious to see what they look like when they’re working, you can see lots of examples in the Amazon review section. You’ll be suitably impressed. 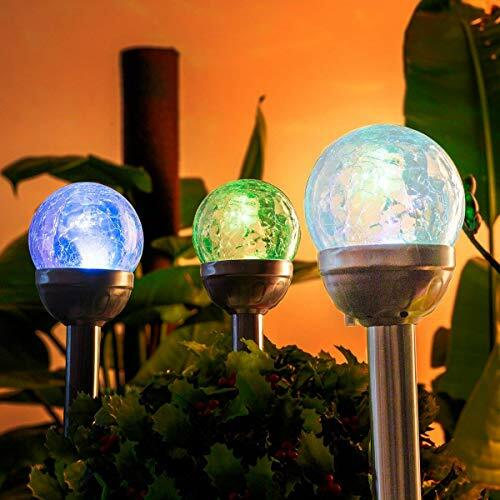 The GIGALUMI Cracked Glass Ball Dual LED Solar Lights are a magical addition to any outdoor space. The unique cracked glass effect casts a delicate patterned light at night and gives you rainbow refractions in the sunlight to add character to your garden. You can choose between two different LED settings with these lights: a clear white light or a slightly dimmer color cycle that is definitely designed more for aesthetics than for function. These stainless steel and glass lights are waterproof and heatproof so you don’t have to worry about them when the weather gets bad. They feature a rechargeable battery and a 2-volt solar panel, with no wires to worry about. Even in cloudy weather, these lights will charge. They activate automatically once it’s dark and turn off again at dawn with an up to a twelve-hour running time on a full eight-hour charge. They’re super easy to install; just remove the isolator tab to get them up and running and turn the switch to “ON,” selecting which lighting mode you want. The globes are attached to stakes for easy installation, but if you have especially hard soil, the manufacturer recommends making a hole in the soil first to place the stake into so the light isn’t damaged. String lights have a ton of applications. Whether you’re looking to decorate for the holidays or create a magical fairyland in your garden, the Mpow Solar String Lights are the best sun-powered string lights we’ve found. If you don’t believe us, just check out their review section on Amazon! In addition to being well-built and well-priced, Mpow provides amazing customer service to its buyers. The Mpow String Lights feature 100 warm white LED lights dispersed along 33 feet of ultra-thin and flexible copper wire. They’re also IP64 waterproof and heat-resistant (although they don’t recommend submerging them underwater) which makes them ideal for both indoor and outdoor use without having to worry about weather damage or short-circuiting. The string can conform to any shape, so you can string them up or wind them into a lantern or jar for that magical fairies-in-a-bottle vibe. These lights have a two-volt solar panel which is attached to a stake that you can put in the ground and run for up to eight hours on a full charge. They’ll turn off when they detect light and come on automatically once night falls. As with any solar light, you’ll need to make sure that the solar panel isn’t blocked from the sun and that the solar panel is turned on so that it will charge. You can choose between eight different working modes: “combination”, “fireflies”, “waves”, “fading”, “chasing”, “fading slowly”, “twinkle”, and “steady on”. It’s easy to change the lights to suit the occasion! The lights will also remember which setting they were on last when turned on again in the future. 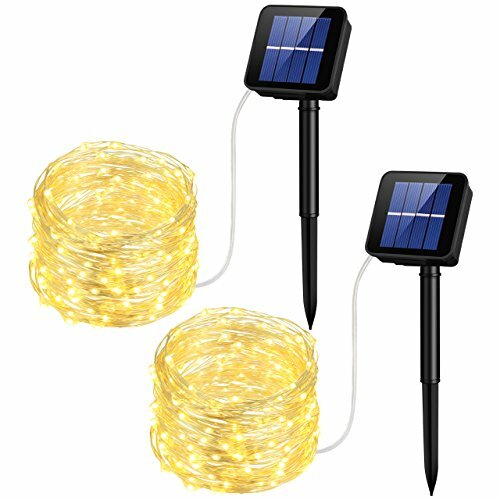 Out of the many different solar string lights out there, these really are one of the best on the market and are available in packs of either two or four. PREMIUM STAINLESS STEEL DESIGN & SUPER-BRIGHT! Super-Bright 15 Lumen clear light shines forth from each LED light in this SIX (6) pack. Position them on your path for the ultimate in beauty AND safety! (Included ground stakes are packed in light poles). 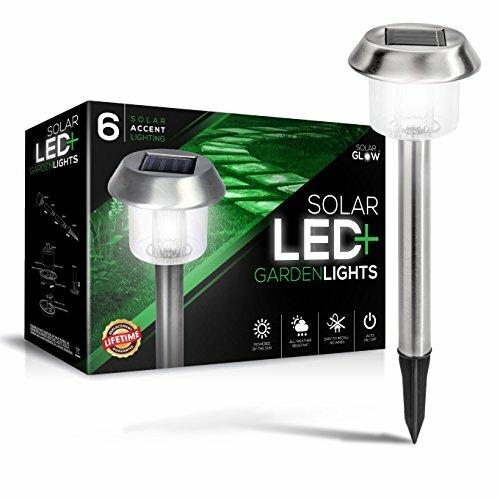 If you’re looking for something a bit more practical to light up pathways at night, the SolarGlow Solar Garden Lights are perfect. With a lot of solar lights, you run into the issue of the lights not putting out as much brightness as their non-solar competitors, but that is absolutely not the case with these. They put out 15 lumens of bright white light so they’ll clearly illuminate any space you put them in. These lights have a simple stainless steel design with the solar panel on the top so they can charge during the day without needing to be plugged in or using any kind of wiring. The design is weatherproof – some people even report them having survived intact and functional after a hurricane! After their installation, they won’t cost you anything for upkeep and even come with a lifetime guarantee that the seller takes seriously. If you have any problems with these lights, you can contact them with no questions asked. Installation is simple. All you have to do is place them and let them charge during the day – which they do with no effort on your part. With a full charge they can run for more than eight hours, coming on automatically at dusk and turning off again when the sun comes up. The simple design blends nicely with any décor and can be nestled into bushes or line pathways, casting a clear white light that increases both visibility and ambiance for any location. The URPOWER Adjustable Spotlight is a versatile lighting choice. Spotlights tend to be brighter than their garden light alternatives. You can use them to light up large outdoor spaces for functionality or security or to bring focus to landscaping pieces you’re especially proud of. They’re a great and highly functional option and this is one of the best you can get. These lights are super adjustable. You get 90 degrees to work with for adjusting the spotlight itself, so you can use it to draw attention to your favorite backyard features, whether you’ve got some beautiful trees or a fountain, or even an especially-nice wall. The solar panel can be rotated up to 180 degrees for maximum exposure to sunlight and optimum charge. These IP 64 weather-resistant lights retract during the day to charge and automatically come up during the night to illuminate whatever you’ve got them pointed at. Once they’re charged, you can adjust your settings so the lights can either illuminate with a high-light mode or a softer dim-light mode. The attached lithium-ion battery is long-lasting and charges from the sun during the day. It has a cold white light that illuminates really well and is sold in packs of two with everything you need to install them. They can be placed in the ground using spikes – though the manufacturer suggests using water to loosen the soil if you’re trying to place them someplace with tough ground – or mounted using the accompanying screws. There are many different styles and types of outdoor lighting. Our list is focused on solar lights, but if you’re looking for a more comprehensive guide to the types of lights out there and their set-up, check out this guide, as well as our article on Rope Lights. Path lights are a very common type of solar light. They come in sets that are designed to be placed along a pathway to illuminate your way as you walk. They have solar panels attached to each light so that they all run self-sufficiently without using any wiring. You can space them out at any distance, and they’re generally very easy to install. Most path lights are attached to stakes that you can plant in the ground. The amount of light they put out varies depending on their design, so make sure to get a set that is bright enough to fit your needs. Garden lights are designed to be decorative, casting a stylish glow on your garden, delicately uplighting any piece of your outdoor space that you’d like to draw attention to, and subtly changing the feel of your space. They’re popularly placed among plant beds, strung through trees or along the top of a patio or gently illuminating a path. They don’t usually have a high lumen output because they’re designed for style rather than function, but they make an artistic addition to any outdoor space. Spotlights tend to have the highest lumen output of the outdoor solar lights because they’re designed to really lighten up an outdoor space. They can be layered to keep an outdoor space very well lit, or scattered on to draw attention to focal pieces of your yard, like trees or fountains. Solar lights are one of the easiest ways to keep your outdoor living space illuminated because they require very little upkeep and run at no cost to you (well, once you’ve purchased them and set them up). Solar lights are extraordinarily cost-effective and as more and more research is directed towards making renewable energy affordable and effective, the costs associated with it continue to drop regularly. Once installed, they don’t cost you anything at all to run! They’re very easy to set up because you don’t have to worry about wiring them up or even making sure they can be plugged in someplace. Say “goodbye” to your extension cords! Just make sure that they’re in a location where the sunlight can shine on the attached solar panels and you’re good to go. It’s good for the environment! Using solar lights reduces your carbon footprint because you’re utilizing renewable energy in your own backyard. You can feel good about doing your part for our planet as you look out over the beautiful backyard you’ve designed. The Ingress Protection rank tells you how waterproof a product is. When you’re looking at solar lights, having an IP rank of 64 or higher is essential if you live in an area where there’s any chance of heavy rain or any other liquids landing on your light. If the rank is at least 64, then it’s waterproof and you don’t have to worry about it shorting out, but you probably shouldn’t test it by submerging them. Obviously, with any light, you want to consider exactly how much lighting you’re looking for. This is typically measured in lumens. If you want functional lighting to really illuminate an area in order to use it, you want something that has a higher lumen output, like the Solar Glow Solar Garden Lights. If you want your garden lights to double as security, you’ll also want a brighter light. Lights that are used for ambiance or atmosphere tend to have a lower lumen output. They’re for mood lighting rather than function and are more stylistic than practical. Most of the lights on this list fall under this category. Here’s a handy breakdown from the Department of Energy on using lumens to pick out the best lights for you. Make sure you remove the protective screen from the solar panel or they won’t be able to get full charges. Before turning the light on, let it charge for two to three days. This allows it to charge to full capacity so it’s likely to last for longer during the night. Be careful with your placement. Because they’re solar powered, your light needs to be someplace where it can get a full charge, which means that the photovoltaic cell is unobscured and, if it’s angled, angled towards the sun. Keep an eye out for trees or walls that will shade your light and lower its output. Another thing to keep in mind is that many solar lights are activated by the dark and will turn on automatically if there’s no light. One of the drawbacks is that if you leave these lights in a well-lit area, under a streetlight, for example, they may not turn on because they won’t detect that dusk has fallen. Periodically clean your solar panels. All kinds of things can accumulate on your panel to form a layer of dirt or grime that will diminish its ability to get a full charge. A quick wipe down with a dry cloth and warm soapy water is all the upkeep you need to do. You can see some more in-depth tips for caring for your solar lights here. Q: Will solar lights charge through glass? A: The short answer is not really, unless you’ve installed windows that are energy effective and designed for that kind of thing. If you’ve got a room with a lot of sunlight and plants that you’d like to have solar lights in, your heart’s in the right place but it’s not likely to work very well. You lose a lot of power through windows filtering out the sunlight. You could always install large solar panels outside and use them to power some of your electronics though! Q: What solar lights are brightest? A: There’s a bit of misinformation out there about solar lights and their brightness. You can get solar lights that put out the same amount of brightness as regular lights; it’s just a matter of making sure that the lights you get have a high lumen output. 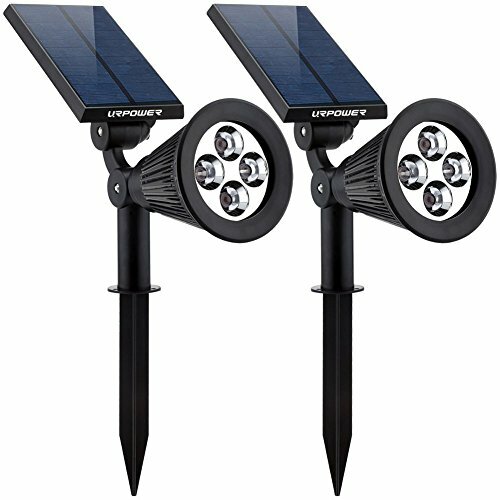 Most solar lights that are designed for ambient lighting typically aren’t as bright, but you can get spotlights ( like the one we’ve listed above) that have super bright outputs. Just check the lumens of what you’re buying! Q: How do solar lights work? A: Solar lights charge through a photovoltaic cell that takes the power from sunlight throughout the day and saves it as usable energy. Usually, they’ll have an attached rechargeable battery which is where they store the power that they then use to power the light at night. They have sensors that can detect when there’s no more light, which means night has fallen, and they automatically turn on until they detect light again – that’s why you have to make sure to place them where they won’t have light shining on them at night to trick the sensors. You can see a more scientific break-down here! Solar Glow produces solar-powered outdoor lighting that is high-quality and highly rated, in addition to providing excellent and responsive customer service. Sunlitec is a company devoted to designing the best LED lighting products around with a focus on creating energy-saving and reliable products. MPOW is better known for its Bluetooth accessories, but they are also ahead of the game when it comes to designing high-powered solar spotlights and is committed to making sure their products work better than others out there. GIGALUMI is well known for its stylish and high-quality lights, designed for both indoor and outdoor use. They have great customer service and are dedicated to making sure their buyers have a good experience. URPOWER is a good company that has a proven customer service record. They manufacture home products designed to make your living space more fun and organized. Whether you want a backyard wonderland, to showcase your shrubbery, or even just to increase the security of your home, there is a solar light out there for you! When you decide to install solar lighting in your outdoor living space, you’re making an environmentally friendly choice that will pay off for you down the road with their easy installation and maintenance. We hope you enjoyed our article covering the best solar lights for your home!